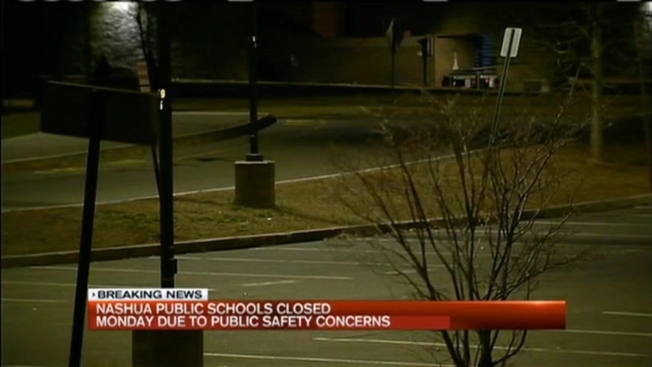 Schools in Nashua, New Hampshire, will be closed Monday amid public safety concerns. Nashua police said credible information regarding safety at public schools has caused the district to close for the start of the week. Police said an email sent to the school district specifically mentions Nashua North High School and Nashua South High School. Two private schools, St. Christopher's Elementary and Nashua Catholic High School, will also be closed Monday. "Public safety is any government's most important responsibility — especially at our schools — and we are closely monitoring the situation in Nashua," Gov. Maggie Hassan said in a statement. "I have been in contact with Mayor (Donnalee) Lozeau and the emergency operations center, and the State Police and state emergency management officials are working closely with the Nshua Police Department, local public safety officials and the FBI. We will continue to monitor the situation and work together at the state, local and federal levels to investigate the threat and keep our communities safe." The police department and Nashua School District are working together with state and federal agencies on the investigation. Supt. Mark Conrad said he expects schools to re-open tomorrow. Necn has a crew at the scene. Check back as this story develops.